You will also find 4.8.42 Release Notes and cumulative Release Notes on the download page. This is a maintenance release that provides a short list of bug fixes. Several of them are minor fixes to the functionality of single-level lists, which are a unique and beneficial feature of LegalBar. Insert a numbered or bulleted list into the middle of an outline. Copy a list style to a new style. It can then be used for a second and separate list with the same formatting as the first. LegalBar’s single-level list styles provide much more stability and ease of use than using Word’s native Bullets and Numbering buttons. A LegalBar single-level list style is actually a paragraph style which has been programmatically tied to numbering template. This is an advantage over Word’s numbered lists, which are not paragraph styles. 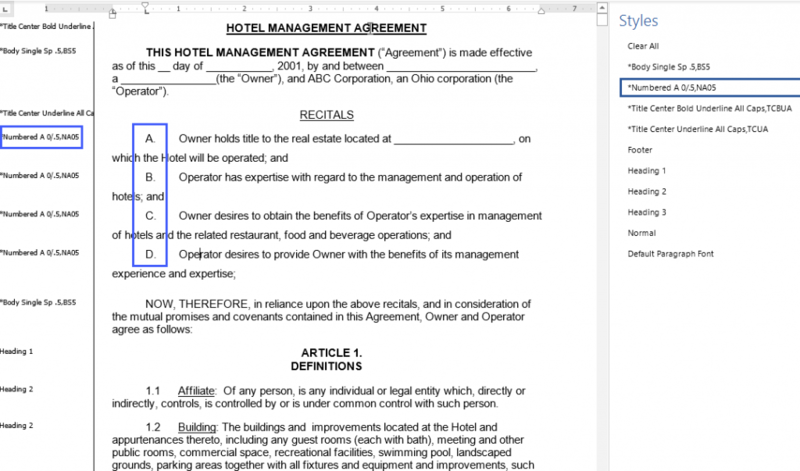 Because LegalBar uses paragraph styles to format simple lists, the style name can be seen in Word’s Styles pane and the Draft View styles area, both shown in the following screen capture, and also in the Navigation pane.